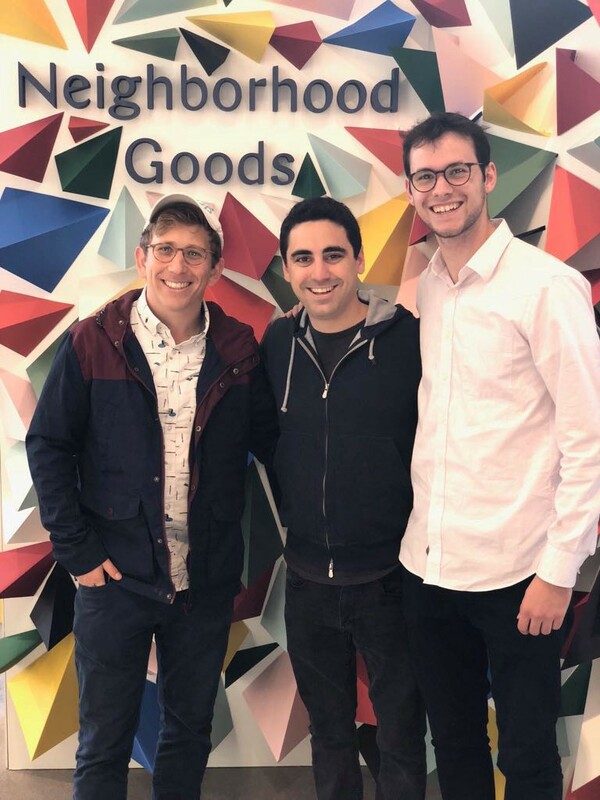 In honor of the biggest shopping day of the year and in celebration of the opening of their first store…we are pleased to announce our participation in the seed round of Neighborhood Goods, a department store with a story. Neighborhood Goods is a new type of department store, featuring an ever-changing landscape of the world’s most exciting brands, products, and concepts. More than that, Neighborhood Goods is a community, bringing thoughtful people together to shop, eat, and learn in its vibrant physical spaces. We are thrilled to be along for the ride with Matt, Mark and the Neighborhood Goods team. We meet a lot of startups. Sometimes those meetings consist of a founder introducing us to a market opportunity that we had never previously considered. Other times we meet a founder who is actualizing an investment thesis that we have long been convinced of. Neighborhood Goods was the latter. We have believed for quite some time that the future of retail is omnichannel, self-serve, on-demand, experiential and curated. When we met Matt Alexander we were excited to find someone with a shared vision of the future of retail and felt strongly that Neighborhood Goods is well-positioned to create a retail brand of lasting significance in this evolving landscape. For years we have been hearing about the imminent death of brick-and-mortar retail as e-commerce was meant to take over the world. In reality, 90% of sales still occur within physical stores and there is a persistent preference for the in-store shopping experience among all demographics. Omnichannel is proving to be the only sustainable business model: digitally native retailers will open stores or face plateauing growth and legacy offline retailers will become experts at ecommerce or go out of business. Even Amazon, the brick and mortar Angel of Death, has shown a strong commitment to a new physical retail strategy through the opening of its own organic store concepts Amazon Go and Amazon Books as well as via the acquisition of Whole Foods. That doesn’t mean that physical retail isn’t changing. Store footprints are evolving to use space more efficiently — the ‘showroom’ approach of having only one of each item, size and color in the front of the store, allows customers to see and touch the items while still shifting the balance away from costly retail square footage to cheaper warehouse space in the back of the store or in some remote location. In line with these trends, Neighborhood Goods enables digitally native brands to make a seamless transition into brick and mortar, affording them the benefits of an offline presence while allowing them to stay focused on what they are best at rather than on developing, rolling out and operating their own physical stores. For many of the brands opening in the first Neighborhood Goods location, this is their first foray into offline retail. And with each brand activation functioning as a showroom for that brand, with limited stock on the shelves or even at the location, Neighborhood Goods is a much more efficient user of space than traditional department stores. 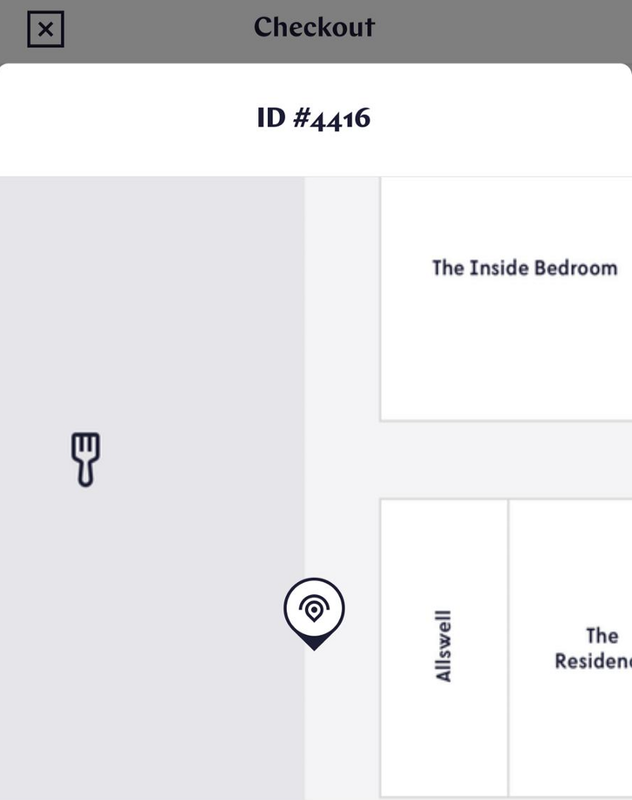 As landlords clammer to sign up digitally native brands as new brick and mortar tenants, however, it is important to remember that omnichannel enablement works in both directions: there is a major opportunity for landlords to lead tenants down the path to omnichannel success by providing both physical and digital real estate. Thinking beyond the physical space that their tenants occupy is a key piece of what I call being a Landlord 2.0. Neighborhood Goods provides its tenants with an expanded digital footprint in addition to a physical one: customers can shop across all of the brands that are carried in Neighborhood Goods in one convenient place online at neighborhoodgoods.com. One of the advantages of IRL shopping is the ability to walk out of a store with your purchase. One of the advantages of online shopping, on the other hand, is efficiency: the ability to bounce around effortlessly from store to store and not having to wait in any lines. Different shoppers have different preferences at different times for online versus offline shopping, often depending on how quickly they need an item. Omnichannel retailing enables the hybrid approach of buy online and pick up in store (BOPUS). This trend is gaining steam with consumers who are growing accustomed to instant gratification in an on-demand economy. “Giving customers a variety of options allows traditional brick-and-mortar merchants to leverage their store locations in new ways, drive much-needed online traffic back into the store, and give consumers a broader range of shopping and purchasing choices that make the retail experience more convenient and puts more choice in their hands,” said David Sprinkle, research director for Packaged Facts. 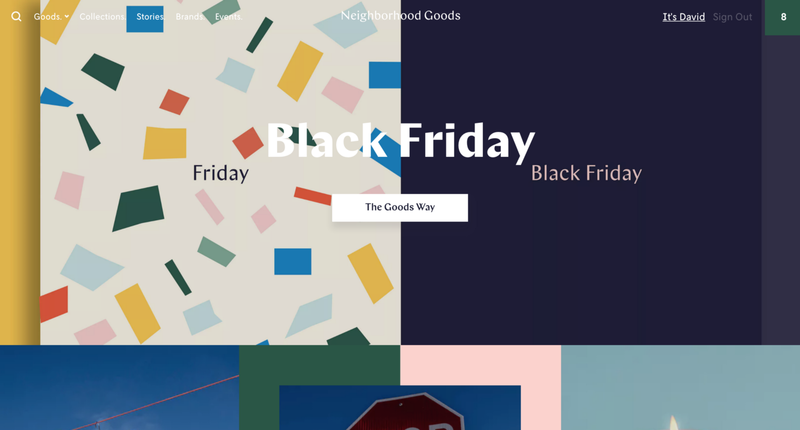 Accordingly, Neighborhood Goods offers different ways to shop to fit every shopper’s preference in a way that makes makes online and offline seamlessly flow into one another. In the spirit of creating this frictionless shopping experience, Neighborhood Goods offers self-checkout in the store. 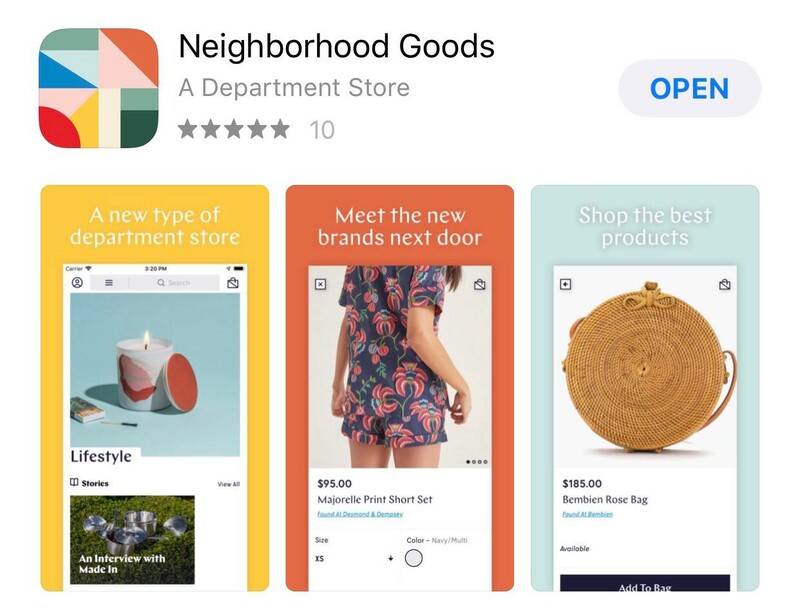 Shoppers can scan an item’s bar code and pay via the Neighborhood Goods app, removing any unnecessary (and sometimes uncomfortable) interactions with sales clerks or waiting in line to pay. Like magic, the app’s built-in indoor positioning recognizes your location in the store (and offers you the option to snap a selfie to make it even easier for you to be found) and a member of the Neighborhood Goods team brings you your items from the back of the store already bagged and ready to go. Just in case a shopper does want to speak to someone or to checkout the old fashioned way, there are plenty of Neighborhood Goods staff nearby to assist. While ecommerce may possess an advantage for efficiency-minded transactional shopping, brick and mortar has a clear advantage for social, experiential shopping. A core part of the philosophy of Neighborhood Goods is that the store should be a social gathering place. This belief is manifest in the physical design of the store, which includes a proprietary restaurant concept called Prim & Proper, and which provides ample communal space to host workshops, lectures and other events like product launches or parties. The social experience is about more than just enhancing the fun of shopping: the opportunity for digitally native brands to interact face to face with their customers and for customers to get to know the stories behind the brands can build a stronger, long-term relationship between the two sides. The Neighborhood Goods app also makes shopping at Neighborhood Goods a great experience. In addition to being efficient, the novelty of self-checkout makes it extremely fun. The app also offers other cool features like the ability to chat in-app with store staff or to have them bring something to you while you sit at the restaurant. Again leveraging the indoor positioning, the app displays great targeted content about brands based on which brand activation a shopper is standing nearby so that they can get to know the stories behind the brands. For any experience to stay fresh it must be dynamic. Unlike traditional department stores where the only things that occasionally change from visit to visit is the clothes on the racks, Neighborhood Goods will feature a revolving set of brands and categories so that each visit to the store is an opportunity to discover and interact with new brands, new installations and new events. The dynamism is even programmed into the in-store food & beverage concept, where the menu evolves throughout the day and covers everything from breakfast to a coffee pick-me-up to after-work drinks. People want to be exposed to items and ideas that are new. However, most prefer that someone else do the heavy lifting of the discovery and filtering process. We want there to be a high signal to noise ratio by the time new things reach us, which is why we follow curated content feeds online or subscribe to services like Stitch Fix. Neighborhood Goods delivers this value proposition with a curated set of brands that only includes the most interesting emerging digitally native category leaders and that covers kids, men, women and lifestyle so that there is something for almost everyone. As mentioned earlier, formerly online-only brands have discovered that brick and mortar delivers a lower cost of customer acquisition. The corollary to this is that most consumers (myself included) have an easier time discovering new brands when shopping offline. The highly curated offline discovery process that Neighborhood Goods facilitates will hopefully keep shoppers coming back into its store again and again. Neighborhood Goods is also producing and curating retail and brand-oriented content like this section on their website dedicated to Behind the Brands stories and a soon-to-be-launched podcast that will be recorded in the store. The power of these stories to upgrade shoppers from customers of these brands to evangelists is another way that Neighborhood Goods is thinking about how to deliver value to its tenants beyond the physical space of its store. For a full list of brands currently in the store, click here. It was special getting to see Matt and Mark’s vision come to fruition last week. There was an energy in the store that defied the harbingers of the retail apocalypse and signified the dawn of a new retail era. We wish them success in the first (of hopefully many) locations and are excited for the journey ahead. Ground Up Ventures is an early stage venture capital firm investing in pre-seed and seed stage startups in the US and Israel. Ground Up Ventures is a seed stage venture capital firm based in the US and Israel. Ground Up invests in mission-oriented founding teams beginning the arduous journey of building an enduring business from the ground up.